The Cy-Fair Educational Foundation is celebrating the 10th anniversary of Salute to Our Heroes Gala, honoring the men and women who serve our country. Proceeds raised during Salute to Our Heroes go to an endowment, which enables CFISD students to attend college. The 2018 Salute to Our Heroes Gala will take place at the Omni Houston Hotel at Westside on Saturday, February 3, 2018. This special evening is highlighted with an inspirational speaker, dinner, entertainment, live and silent auction. Sponsorship opportunities are available. Individual tickets are priced at $125, and Veteran tickets are $75; click to learn more about advertising opportunities, and to view our 2018 Salute to Our Heroes flyer. We’re honored to welcome Salvatore “Sal” Augustine Giunta as our speaker for the 10th Anniversary of our Salute to Our Heroes Gala. Giunta was awarded the Medal of Honor by President Barack Obama on November 16, 2010. Staff Sgt. Giunta was the first living recipient of the Medal of Honor for service in Iraq or Afghanistan, and the first living service member to be awarded the Medal of Honor since the Vietnam War. Giunta joined the Army in November 2003 and was assigned to the 173rd Airborne Brigade Combat Team, Vicenza, Italy. He completed two combat tours in Afghanistan. While conducting a patrol as team leader, Giunta and his team were ambushed by a well-armed, well-coordinated team of insurgents in Korengal Valley on October 25, 2007. Under intense fire, Giunta fought the enemy, administered first aid to his wounded squad leader, and saved another soldier from being carried away by the Taliban. We hope by now you’ve purchased your tickets for our Salute to Our Heroes evening at the Omni Houston Hotel on February 11, 2017! To help our party goers have a great time, we’ve compiled a to-do list to help you plan your evening—now check it twice, and get ready to celebrate! Why drive home when you could enjoy a beautiful stay at the Omni Houston Hotel? Make a mini-weekend getaway out of the night! Book a room and skip the late night drive home, and maybe even visit the Mokara Spa for a little post-party pampering the next morning. The Omni Houston Hotel offers valet parking, however the fee is not included in the price of your event ticket. Click for parking & property details for the Omni Houston. Of course you could always call a cab, or use your favorite ride-sharing service to avoid parking altogether. The program starts at 7:00 p.m., while doors open at 6:45 p.m. sharp! Check in begins at 6:00 p.m. Be sure to make time to view our Silent Auction! Don’t forget to connect with us online! You can find CFEF on Facebook, Twitter, LinkedIn, Pinterest, and YouTube. You can also sign up for our monthly newsletter to learn about upcoming fundraising events. One of our four major events of the year, Salute to Our Heroes, is coming up in less than a month. Held at the Omni Houston Hotel at Westside, this special evening honors the men and women that serve our country. Since Salute to Our Heroes takes place in a few short weeks on February 11th, 2017, purchase your tickets today before they sell out! Salute to Our Heroes features an evening chock-full of entertainment so we’d like to share some of the highlights with you. The Texas A&M Singing Cadets will make a special appearance! 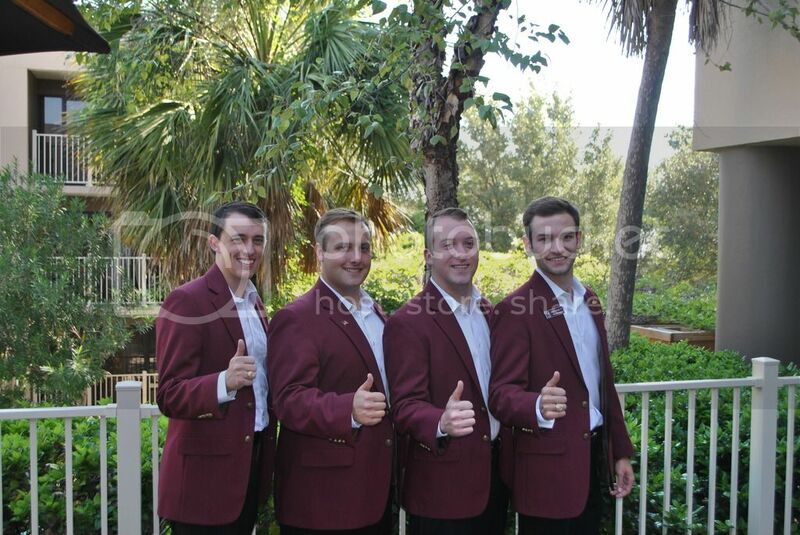 The Aggienizors Barbershop Quartet has played for high-profile folks including past presidents. Another notable moment will be the Missing Man Ceremony which honors our fallen soldiers in all branches of the U.S. military. Salute to Our Heroes would not be complete without our live and silent auctions where some really great items will be up for grabs! Our keynote speaker at this year’s Salute to Our Heroes will be Kris “Tanto” Paronto. Tanto is a former Army Ranger from 2nd Battalion 75th Ranger Regiment who was deployed throughout South and Central America, the Middle East, and North Africa. Tanto was part of the CIA annex security team that responded to the terrorist attack on the U.S. Special Mission in Benghazi, Libya on September 11, 2012. His team’s involvement was essential in the saving of U.S. lives and assets while fighting off terrorists from the CIA Annex. Their story is the subject of the film 13 Hours featuring John Krasinski. For more information on Salute to Our Heroes, check out our video. Tickets are $100 each and $50 for military veterans and active military personnel. For details on ticket sales, please call 281-370-0144. We look forward to seeing you at Salute to Our Heroes! To stay up-to-date on everything happening at the Cy-Fair Educational Foundation, make sure to follow us on Facebook, Twitter, Pinterest, and LinkedIn! Today’s Students, Tomorrow’s Future! Salute to Our Heroes is our newest event that honors the brave men and women who serve our country. Funds raised from this special evening go to an endowment that enables CFISD students to pursue higher education. This year, Salute to Our Heroes will be taking place on February 11th, 2017 at the Omni Houston Hotel at Westside. Advertising during the event is a great opportunity to support our youth and to bring some publicity to your organization. We will describe the options that are available in our souvenir program book. Inspirational speaker, dinner, entertainment, as well as live and silent auctions will highlight this special evening. Please consider supporting the event with an advertisement in the program, or a sponsorship. For more information about Salute to Our Heroes, please visit our website. For details regarding advertisements, sponsorships, or ticket sales, please call (281) 370-0144. You can also purchase advertisements or sponsorships directly on our Salute to Our Heroes page. We look forward to seeing you in a couple weeks, thank you for supporting our Foundation!